At our annual conference in September I become the Chair of ALT. I have served my time as a Trustee and last year was Vice Chair to our now President, Martin Weller. Being the Chair of any organisation is a quite a “big deal” but it hasn’t actually seemed that real to me until last week when I attended our annual joint Operational Committees meeting and I saw this badge. 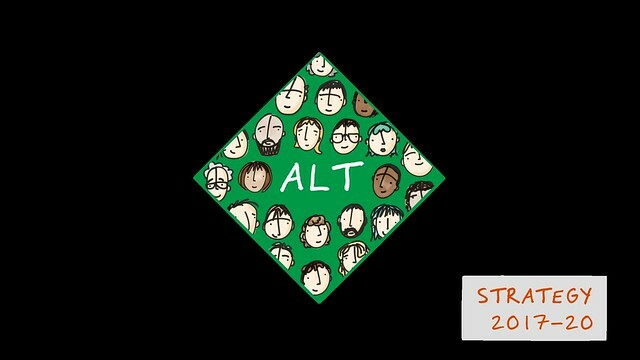 Last year much of the Trustees work was involved in developing ALT’s new strategy. Something of which we are all, quite rightly proud of. This year we really start to put that strategy into action. As the strategy points highlights, ALT really is a community, our members really are at the heart of what we do and collectively we “are greater than the sum of our parts“. The work that all the members involved in our committees and special interest groups are testament to this. ALT has a very small full time staff complement and we rely on the dedication and participation of all our members but in particular those who become committee members. This continues to allow the organisation to provide an increasingly vital, independent voice for the education sector. A part the day was dedicated to the first of a new consultation exercise we are undertaking around new pathways to CMALT, our accredited membership scheme. Now a well established route, it is timely for a review to see how the scheme can be expanded to recognise different levels of engagement from early career learning technologists to more established senior level academics/managers. Although CMALT is increasingly recognised as professional development achievement it doesn’t have the traction of say Fellowship of the HEA which is increasingly becoming a target at University levels for staff development. During part of the discussion there were questions raised about the value of CMALT, in particular for more senior staff, as compared to other forms of professional recognition. That is a challenge, but one as a community we need to overcome and that is down to our community finding new ways of expressing and sharing the value proposition of CMALT. As more of the first wave of learning technologists are filling more senior positions in colleges and Universities, we need to leverage that by getting CMALT moved from a “nice to have” to “need to have”. We also need to extend our reach outside the formal education sector and it was great to see members yesterday from non HE/FE organisations sharing their views on how we can do exactly that. Having done completed my CMALT almost a year ago now, I can thoroughly recommend taking that time to reflect on your own work and professional development. However I also recognise that I put getting HEA Fellowship ahead of CMALT as it was an institutional driver and something I had to get. I am very excited at seeing how this consultation exercise evolves and how the extended scheme will be implemented. If you have any views that you want to share then keep an eye on that ALT website for more information over the coming weeks. In the meantime, feel free to share any ideas in the comments – or by contacting me directly. As Chair, I have an increased responsibility to represent the views of the ALT community. It is an absolute privilege and honour for me to do this. Like ALT, open-ness is at the heart of what I do, so please do get in touch: my email/twitter/ blog is open to all thoughts about ALT.